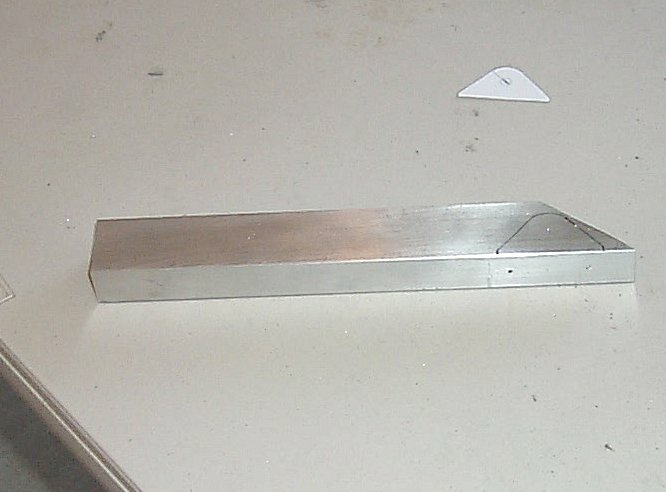 2 January 2010: Drag/Anti-Drag Tubes; Clecoed in place and ready for rivets and glue. 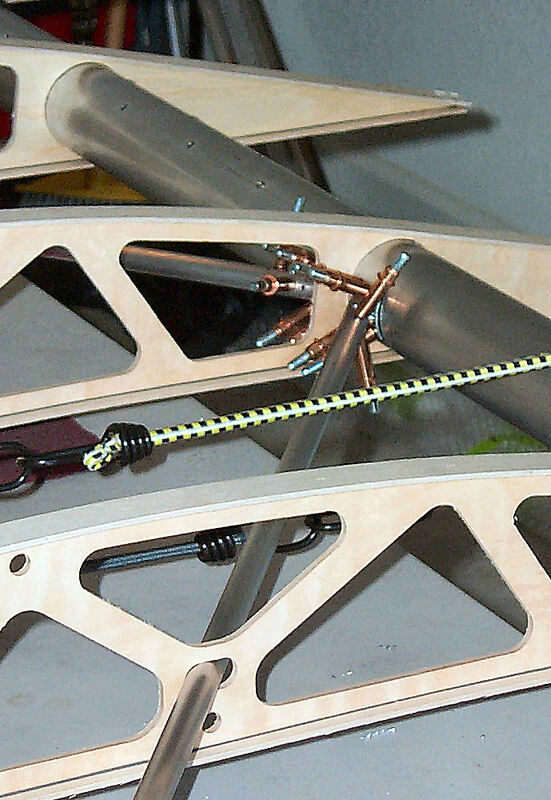 3 - 6 January 2010: Ribs and Drag/Anti-Drag Tubes are riveted and glued in place. 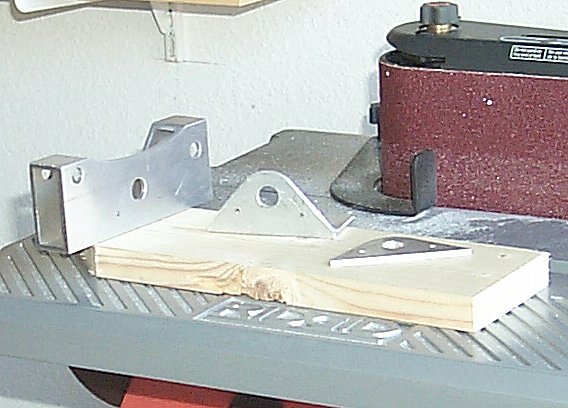 13 January 2010: Stringers are cut to size and glued in place. 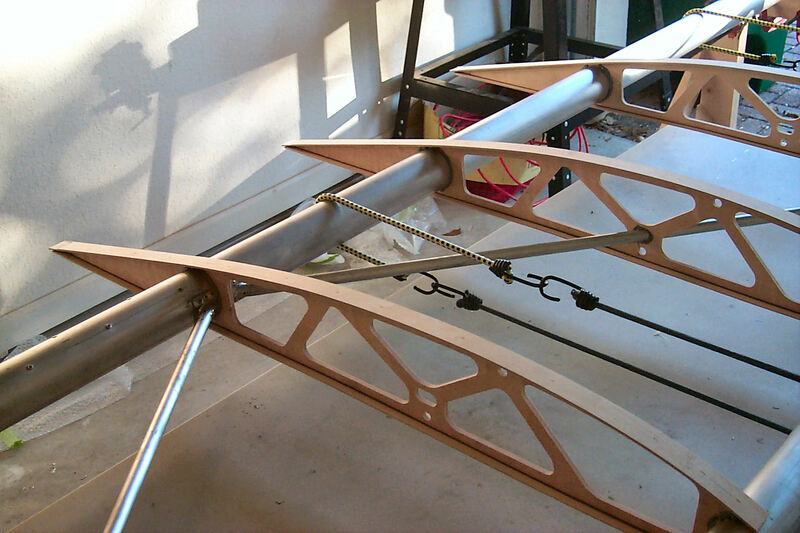 14 January 2010: End rib bracing. 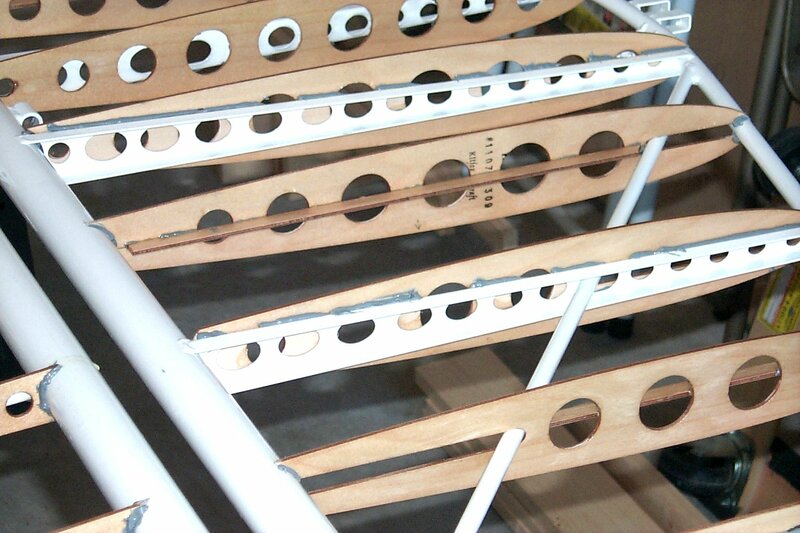 15 January 2010: Glued the upper false ribs. 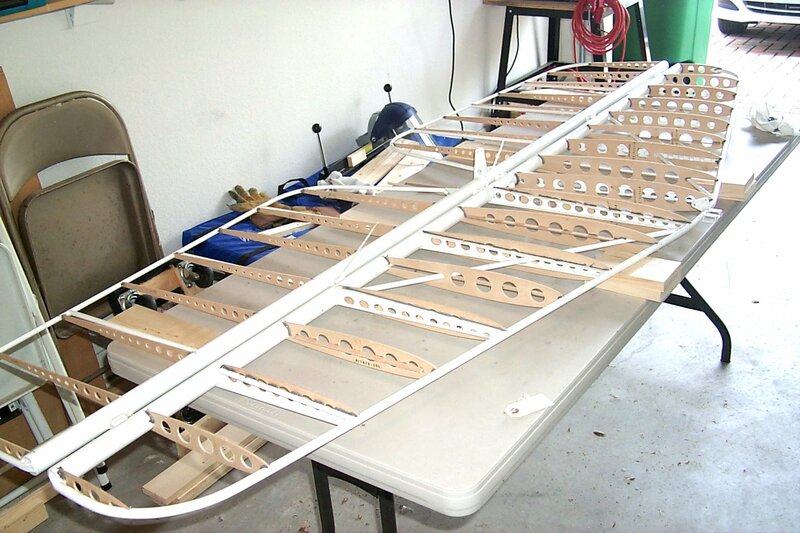 17-18 January 2010: Fitted the trailing edge from rib #3 to rib #10 and made the cut-out in the rear spar. 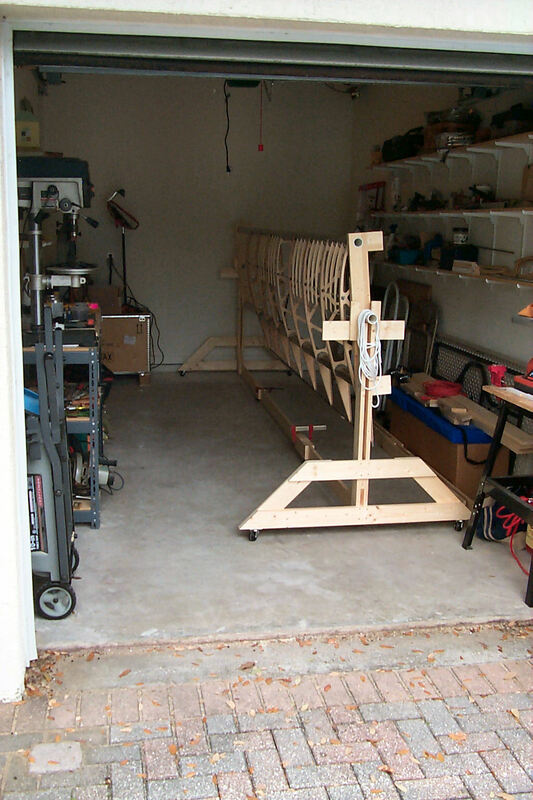 24-30 January 2010: Fabricated a "rotisserie" for the right wing and rearranged the shop for finishing the wings and fuselage construction. 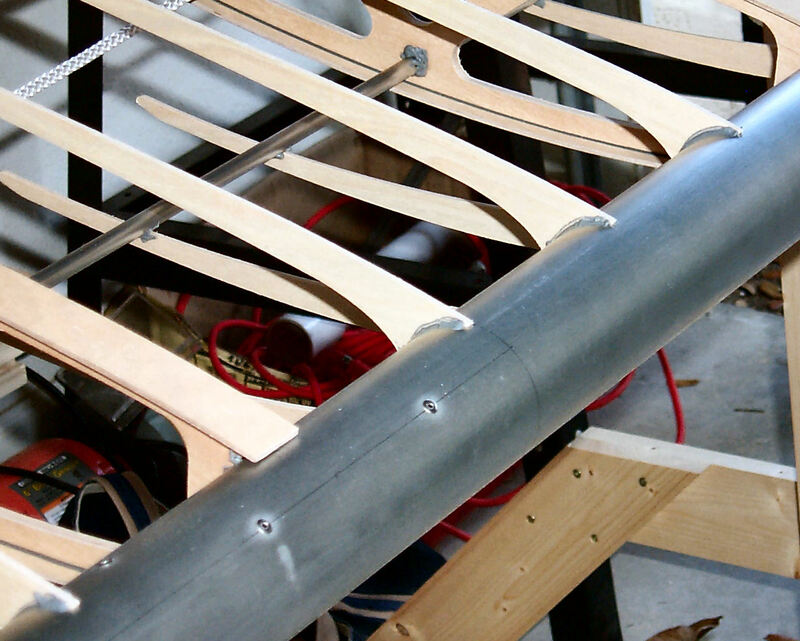 31 January 2010: Glued the bottom false ribs in place. 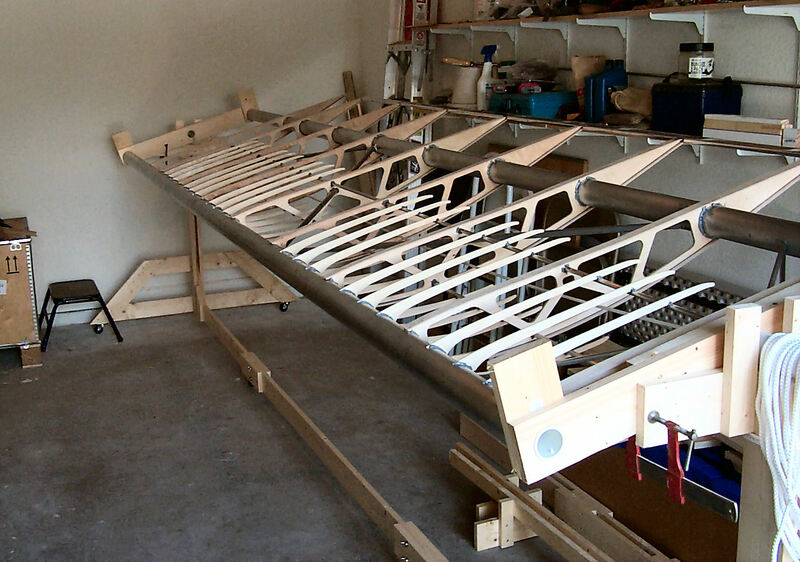 5-6 February 2010: Varnished the ribs and false ribs. 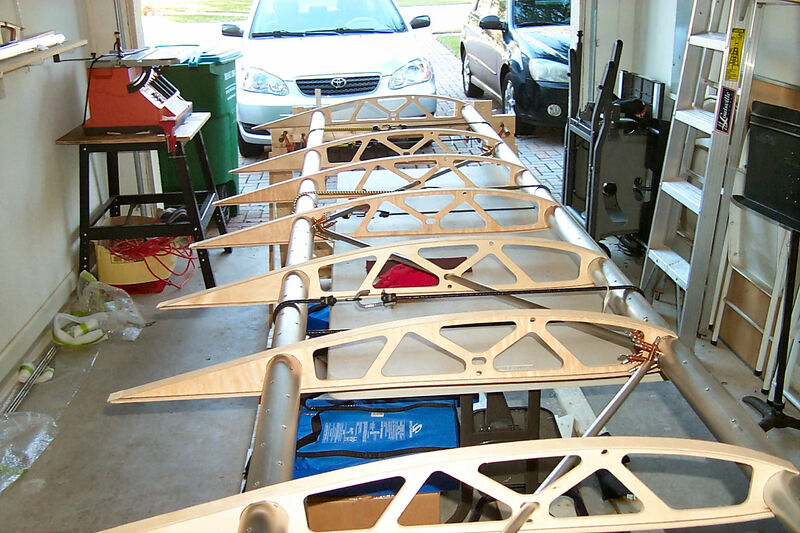 13 February 2010: The right wing is taken to the hangar. 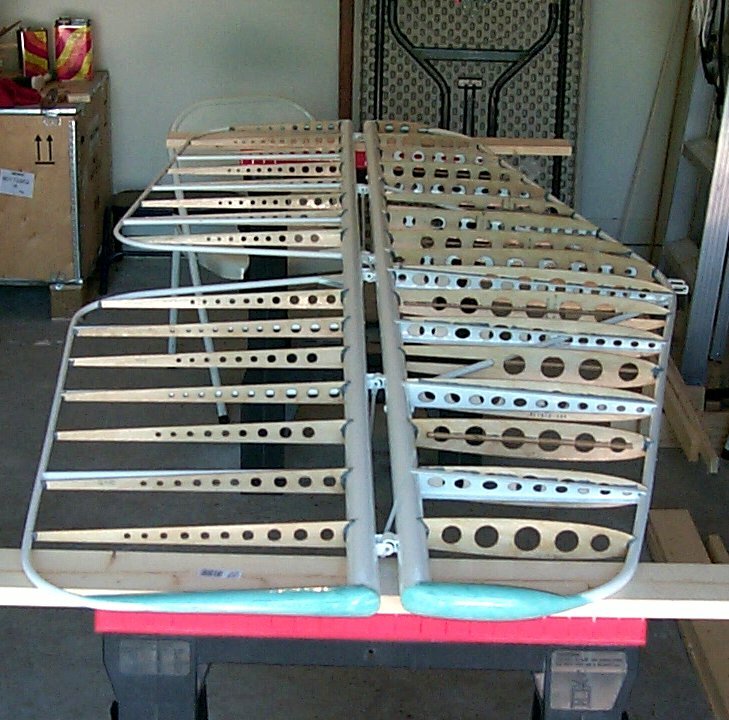 Going Forward; At this point the wings are ready to be rigged to the fuselage. 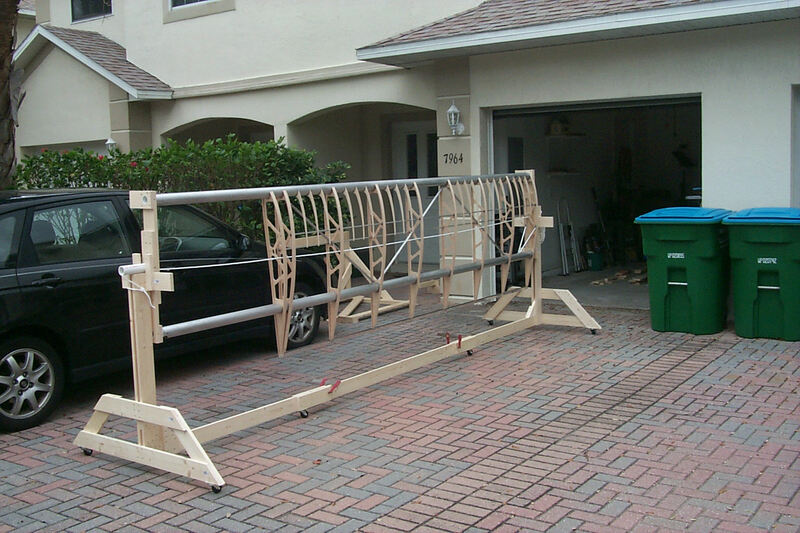 To do this I'll have to store the Cessna in the FBO hangar to allow space for the operation. 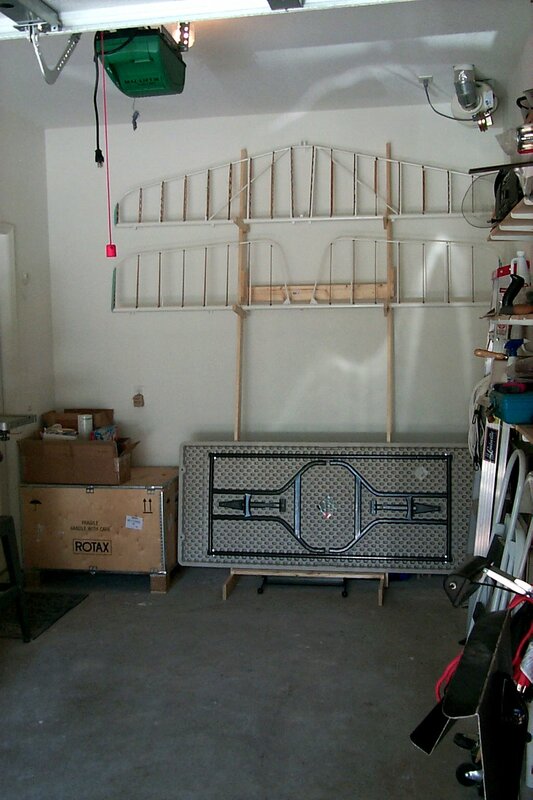 Because of this I've decided to wait until May when I'll be on summer break from my teaching jobs. 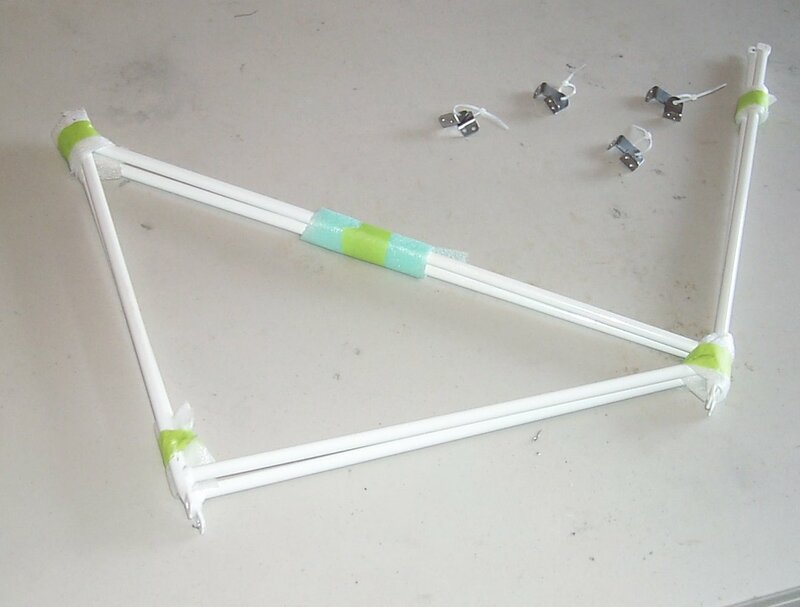 I'll then be able to work full time on the kit and minimize the amount of time I'll have to pay for storing the Cessna somewhere else. 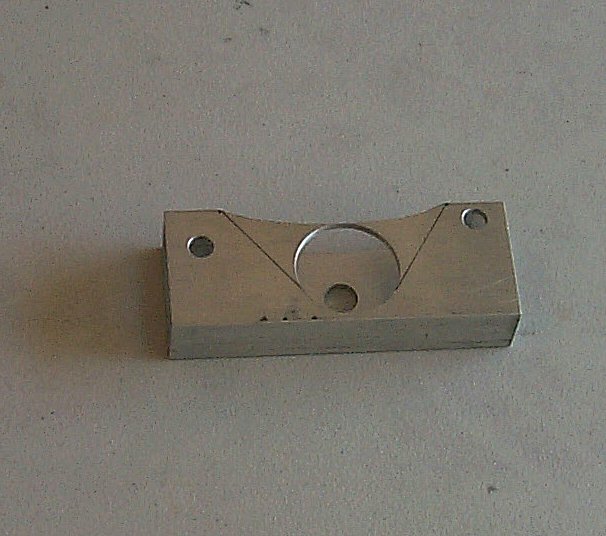 Meanwhile I can busy myself making fiddly bits. 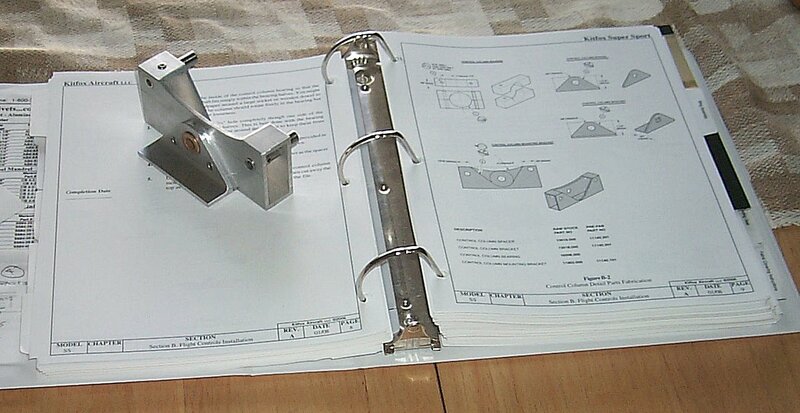 There are quite a bit of small parts that have to be fabricated. 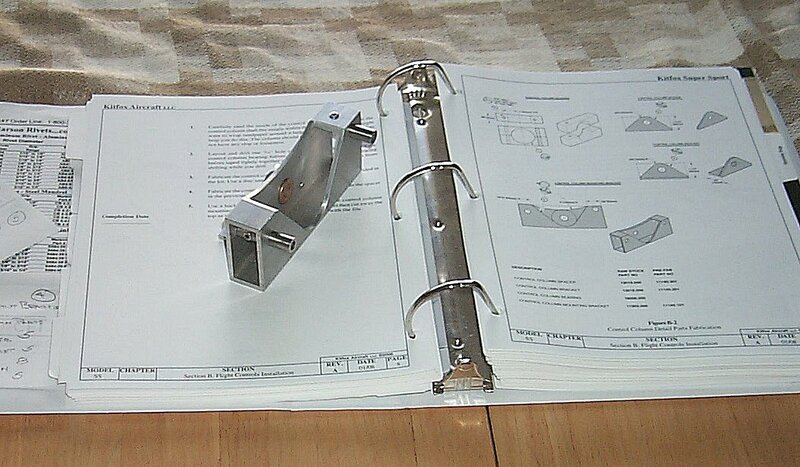 21 February 2010: Jury Strut Brackets. 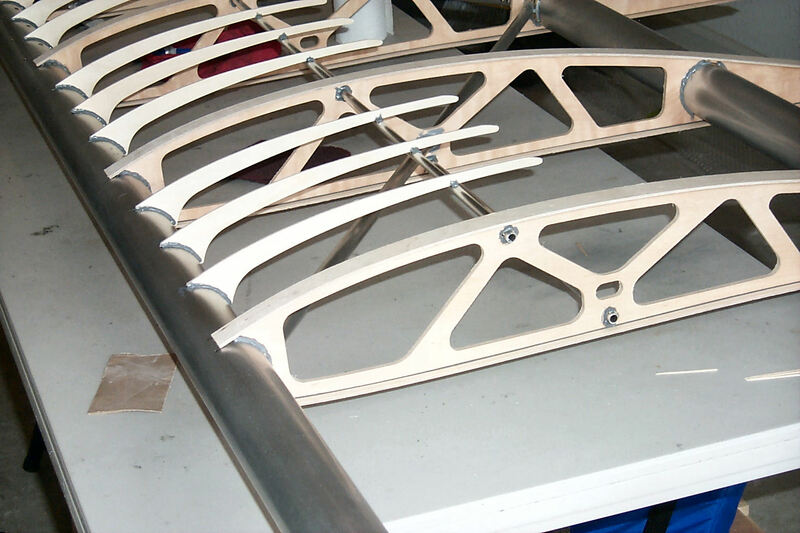 The photos show the steps taken to fabricate the brackets that attach the jury struts to the wing spars. 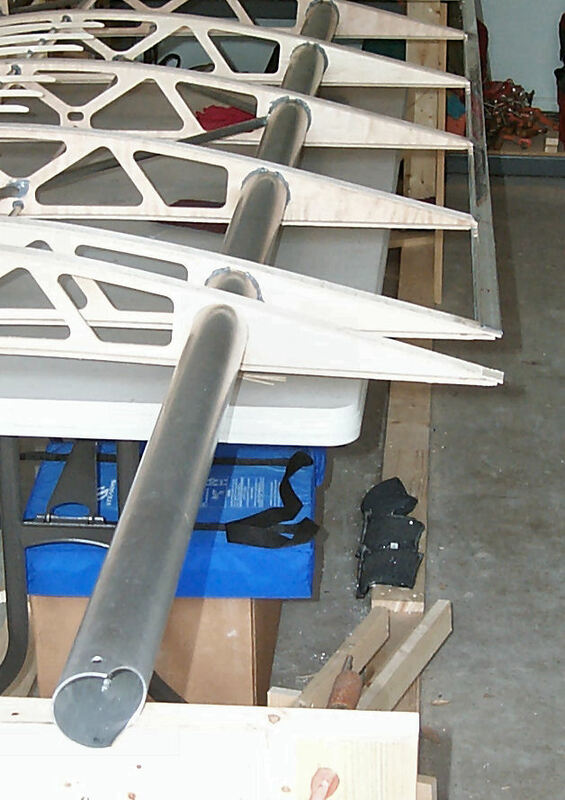 26 February to 1 March 2010: Wing Spar Reinforcements. 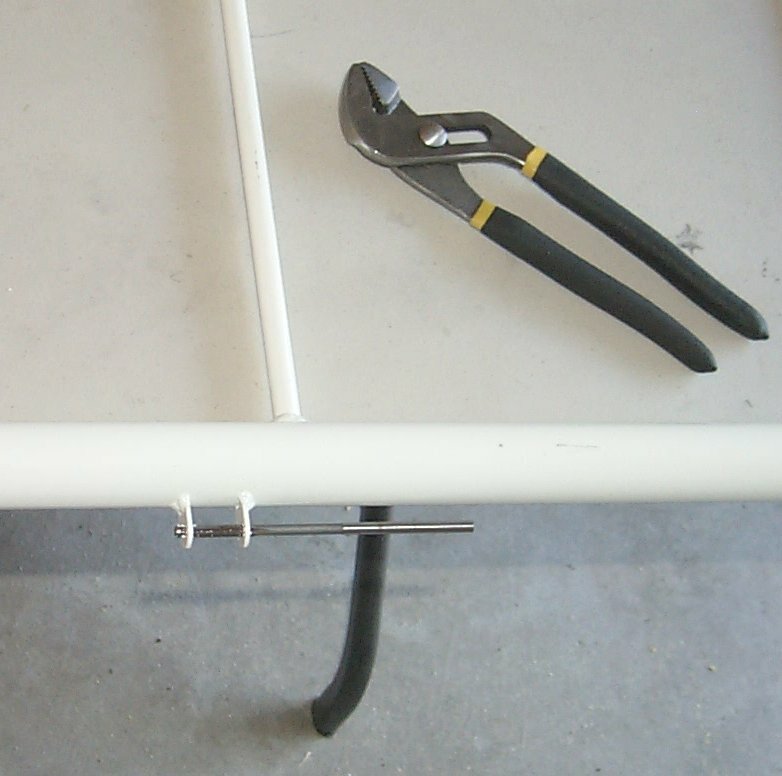 You will notice in the second photo that I clamped a piece of PVC pipe the the drill stand to approximate the curve of the metal stock. 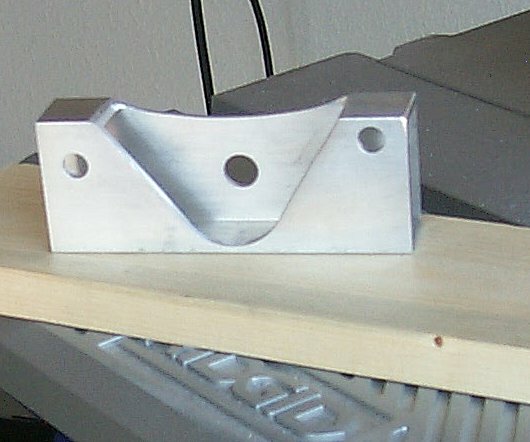 4 March 2010: Control Column Bracket. 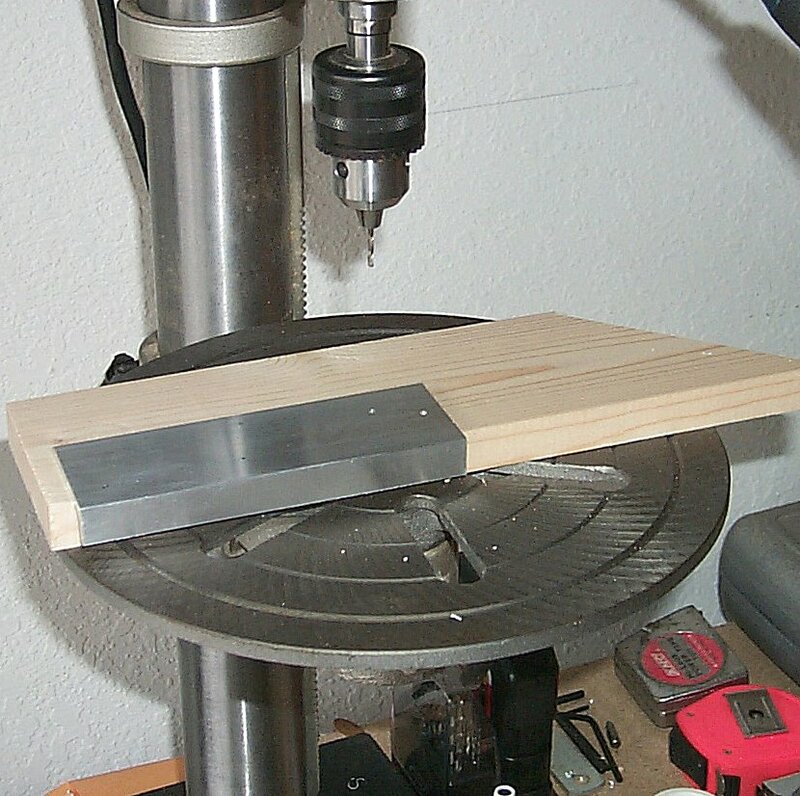 Once again I'm improvising a drilling jig. 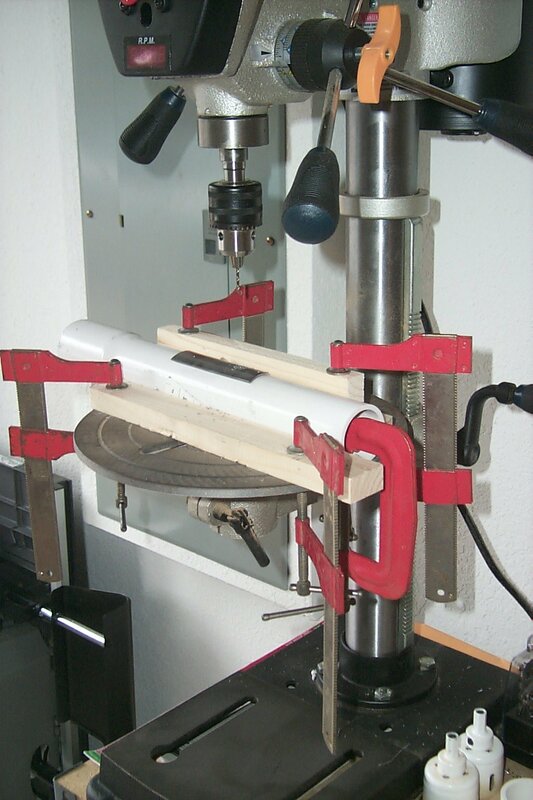 This time to drill a hole into a round sleeve. 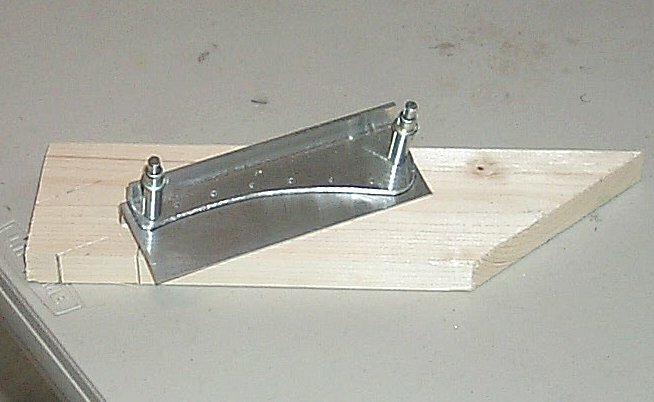 6 - 12 March 2010: Flap and Rudder Pedal Detent Brackets. 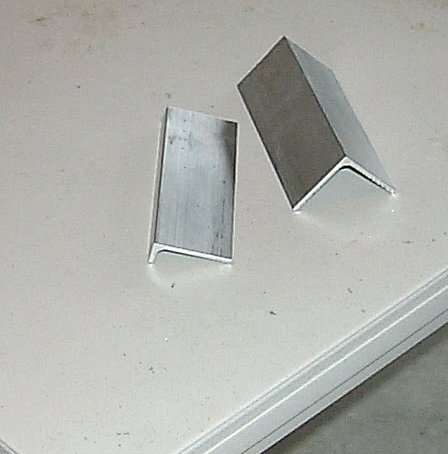 A small photo essay showing the steps taken to fabricate these brackets. 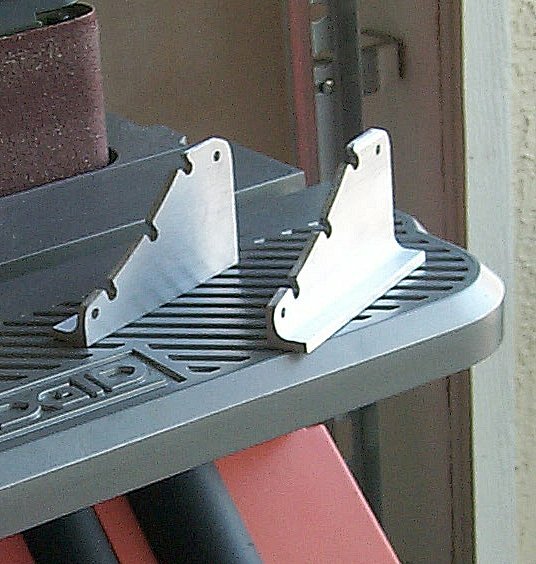 19 March 2010: Rudder Pedal Brackets, These parts were fabricated from a single rectangular aluminum tube. 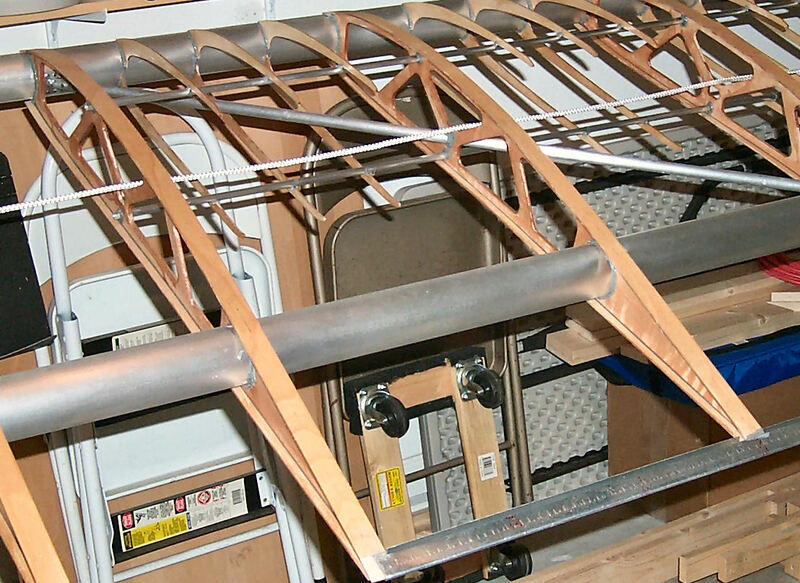 26 March 2010: Adjustable Stand, I'm now focusing on fixtures needed to help me rig the wings to the fuselage. 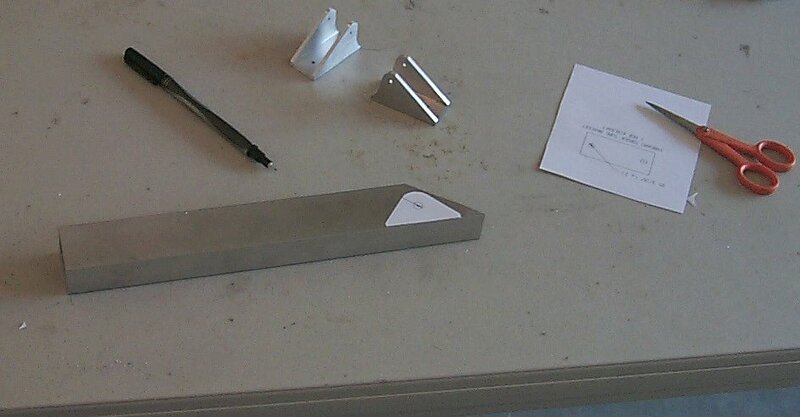 Today I started to make stands to position the wing tips. 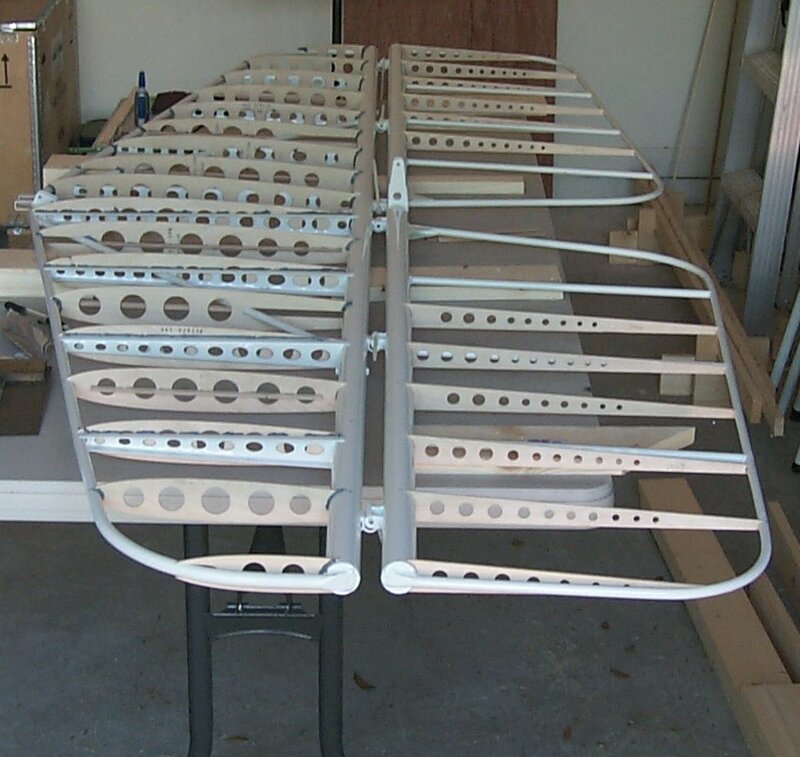 Two are needed for each wing. 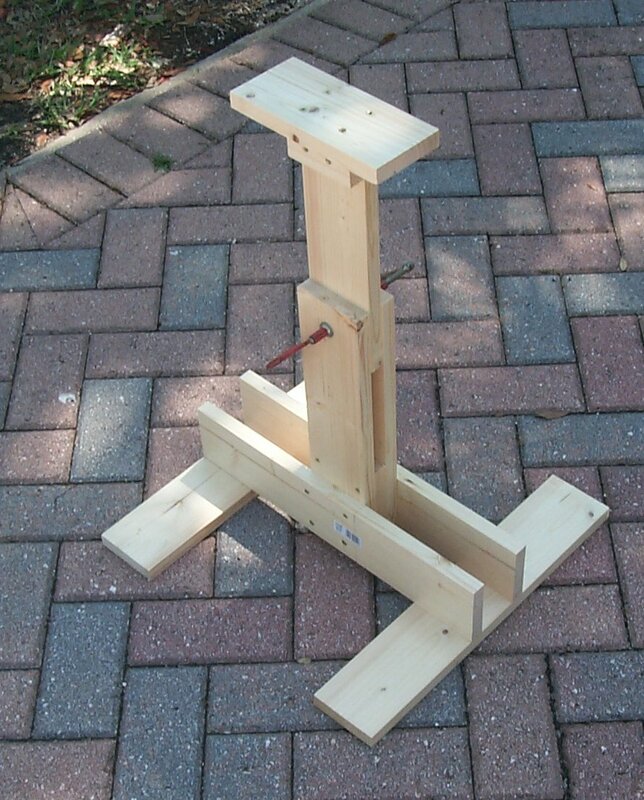 Each stand has two uprights between which a crossbeam can be clamped and extended to another stand. 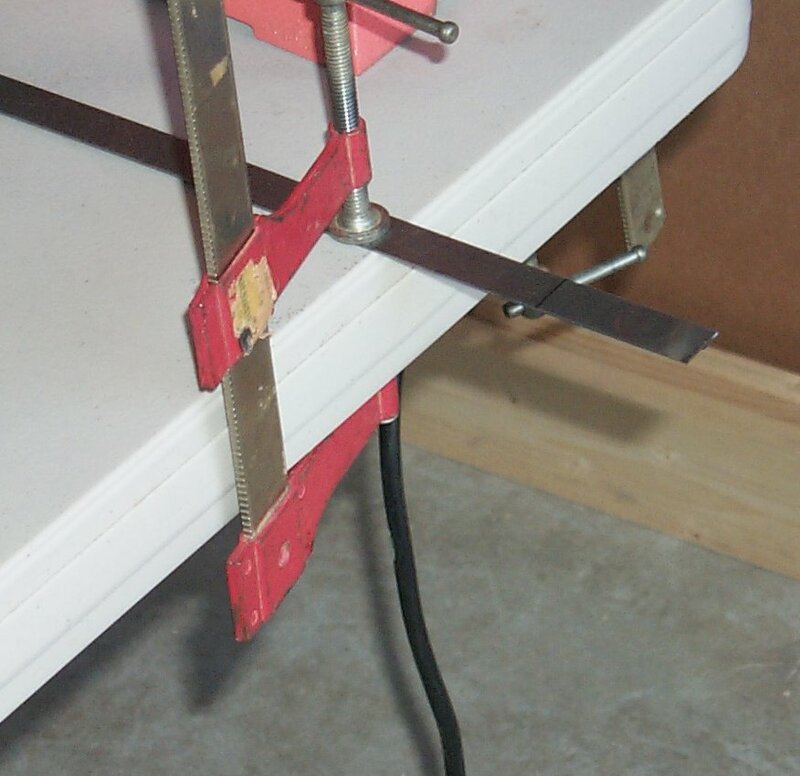 My idea is to be able to achieve exact positioning of the crossbeam by loosening the clamp and tapping the crossbeam either down or up. 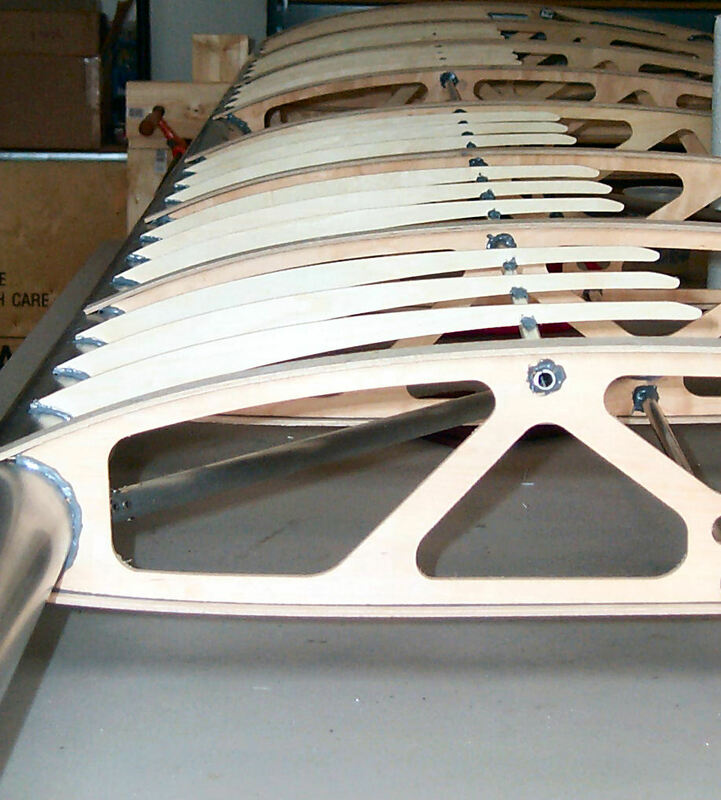 7 April 2010: Began assembly of the horizontal tail surfaces. 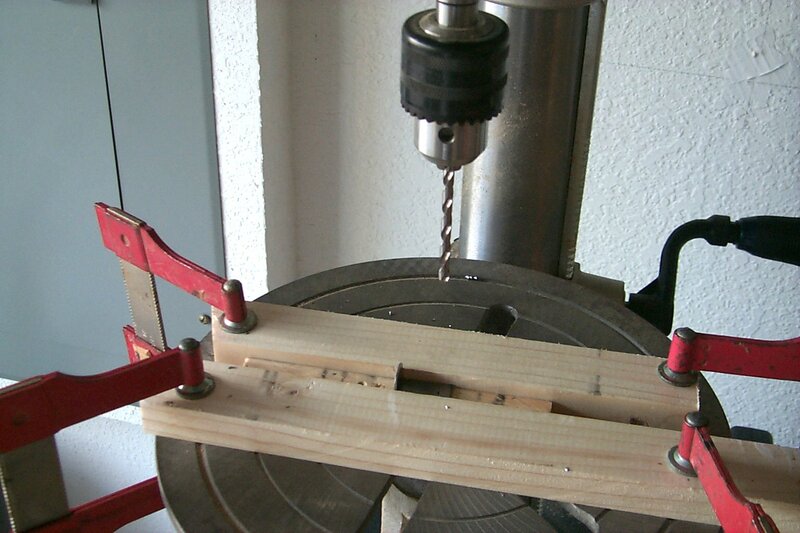 7-10 April 2010: Reaming the hinge fittings. 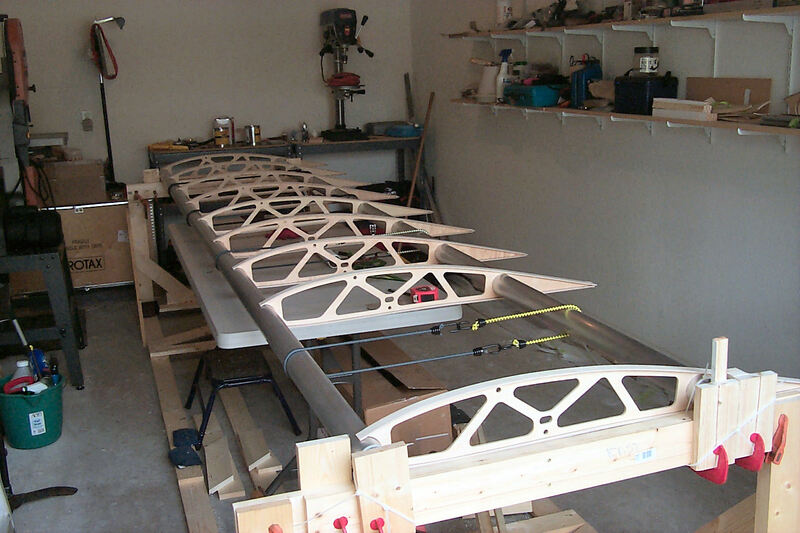 11 April 2010: Fitting and gluing horizontal stabilizer ribs. 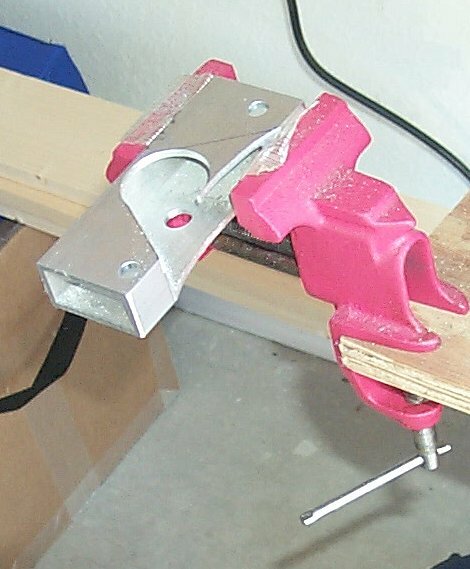 It's probably more accurate to call these formers since their only purpose to provide shape to the stabilizer. 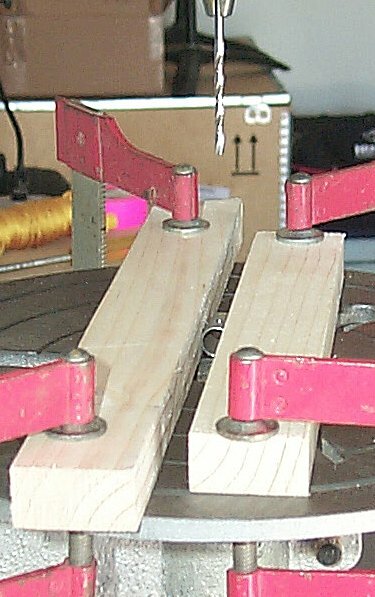 Four have been glued directly to the structure and two others have had stiffeners glued to them before attachment to the frame. 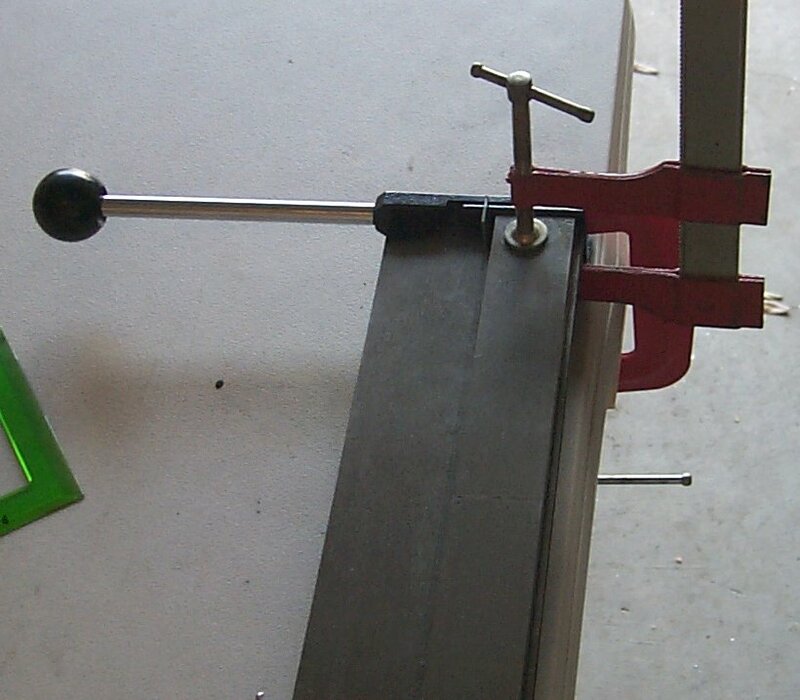 I'm using old drafting weights to secure the ribs while the glue cures. 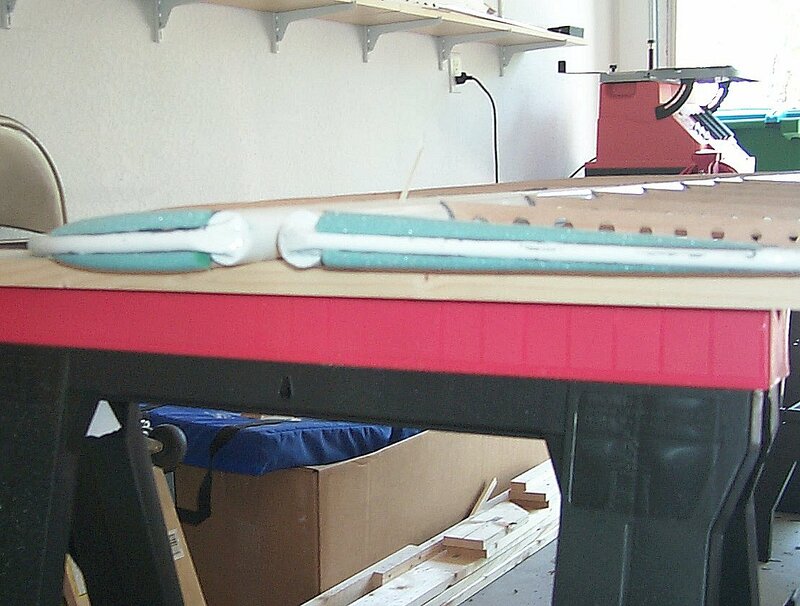 20 April 2010: All that's left is to glue the two ribs that are waiting for the epoxy to cure on the stiffeners. 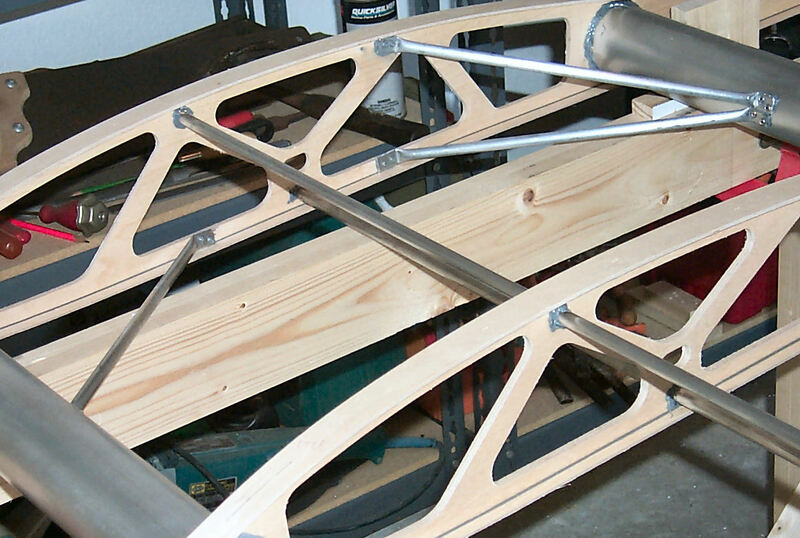 23 April 2010: I begin fitting the elevator ribs. 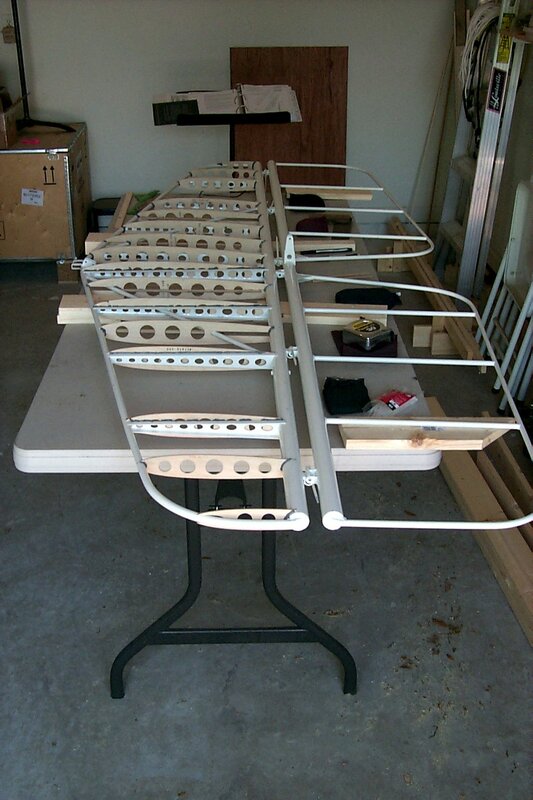 I've temporarily tacked 12 elevator ribs with spots of super glue. 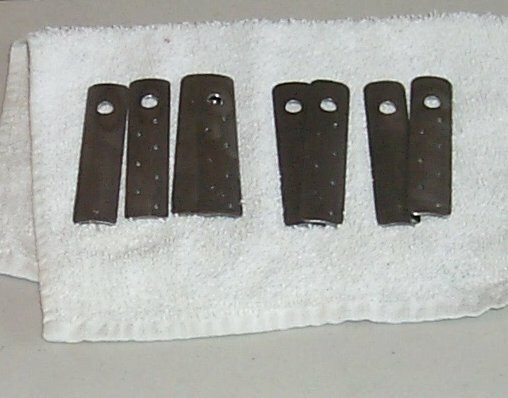 Later I will permanently bond them in place with epoxy fillets. 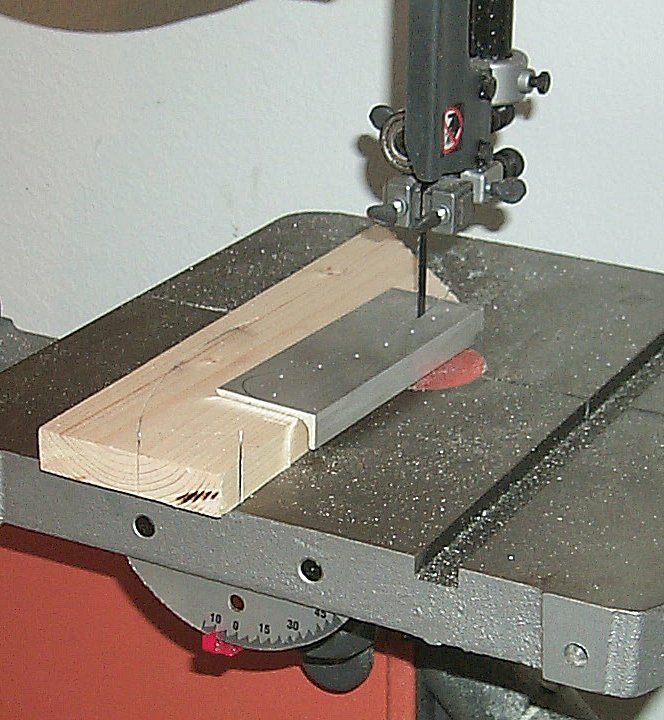 I use a disposable syringe to form the epoxy fillets. 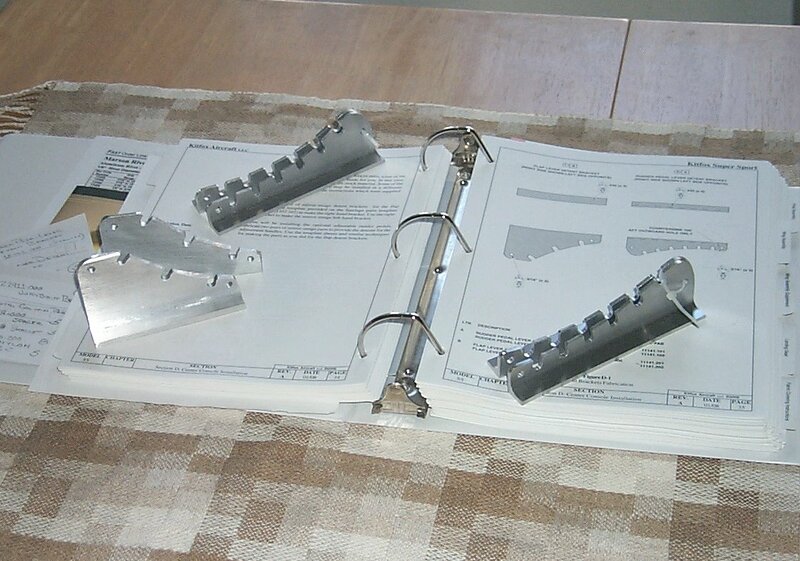 The catalogue describes it as reusable but it would be very tedious to remove cured epoxy from it. 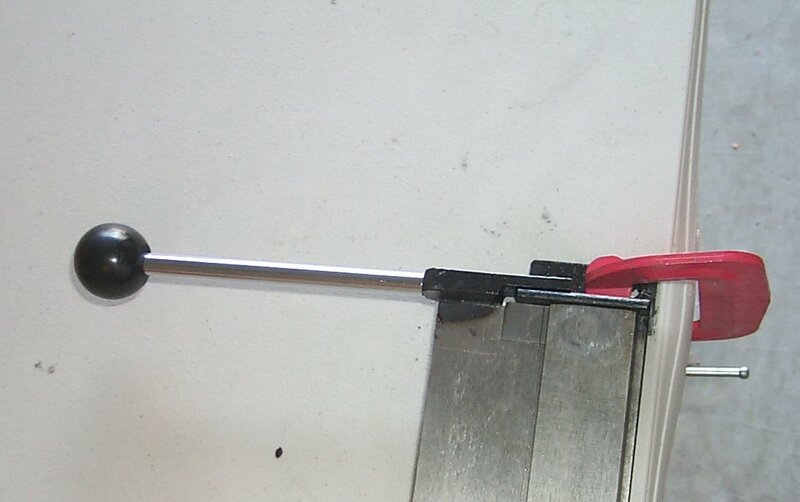 Also to clean uncured epoxy from the syringe would probably take more solvent than it's worth. 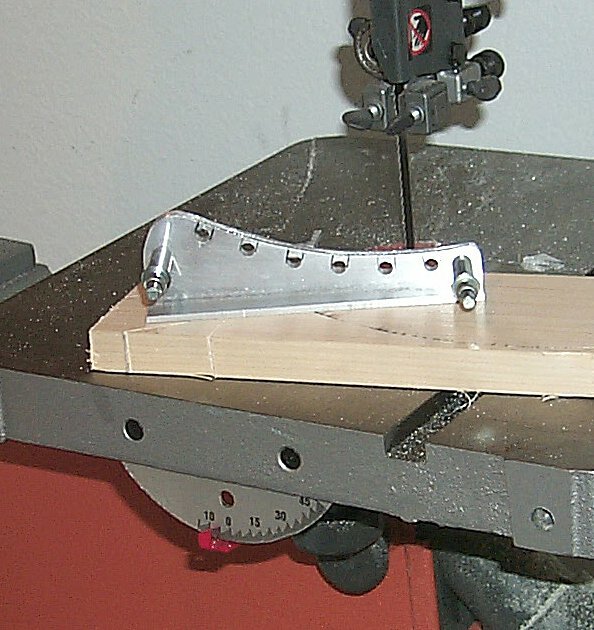 24 April 2010: I begin applying the epoxy fillets. 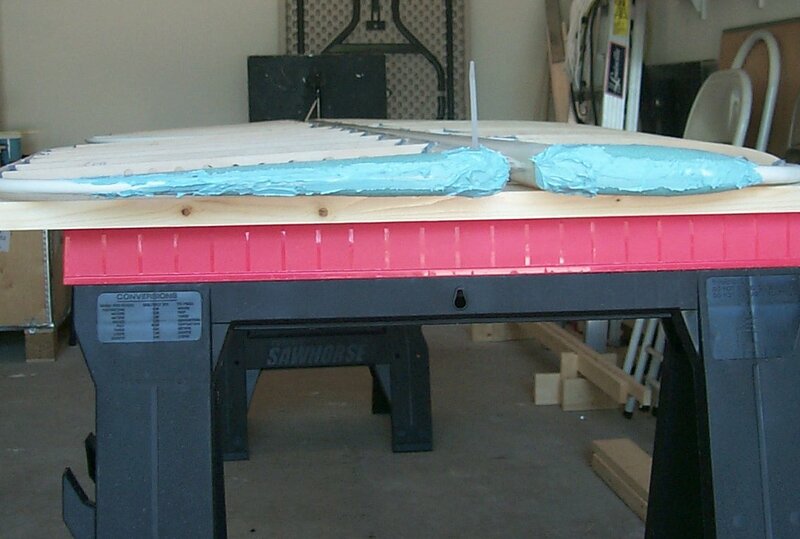 25 April 2010: The epoxy fillets are complete. 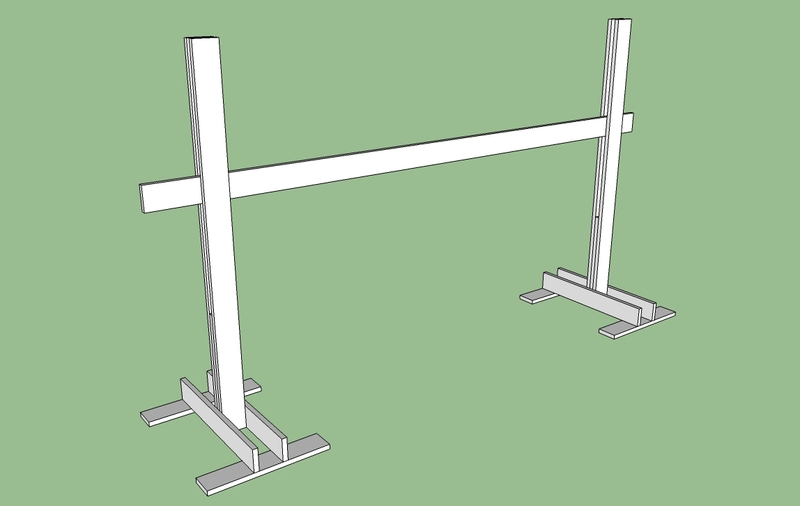 I had to turn the assembly over to gain access to places I previously could not reach. 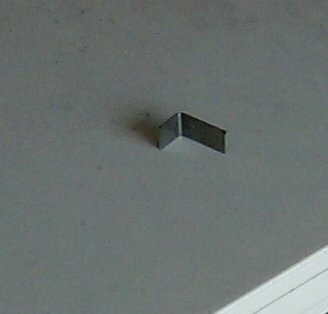 This required my placing it on horses since the elevator horn prevented me from setting it on the table. 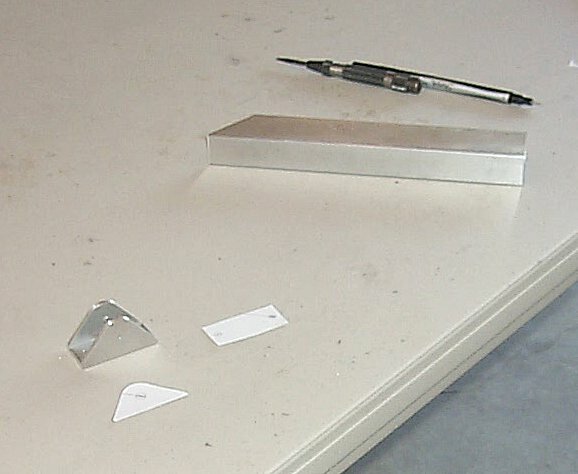 30 April 2010: End Caps. 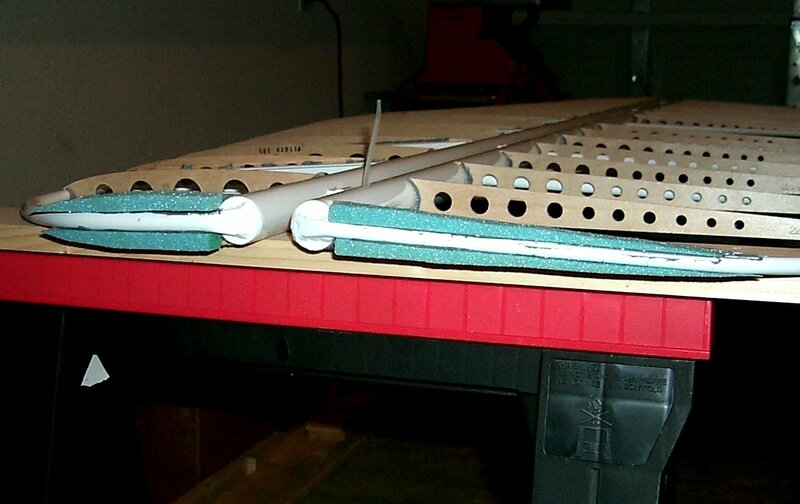 I begin fairing the tips of the horizontal stabilizer and elevator by gluing rough-cut foam blocks in place. 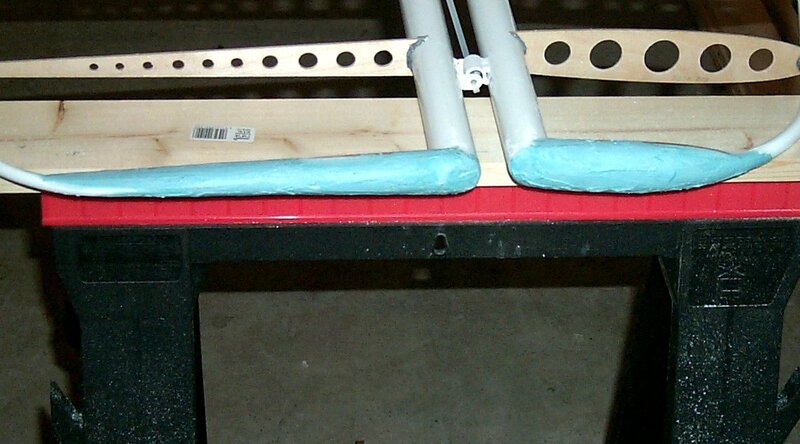 When the epoxy is cured I will sand to shape and fill the gaps with SuperFil. 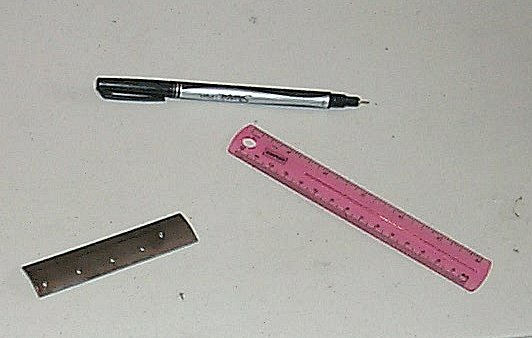 1 May 2010: End Caps continued. 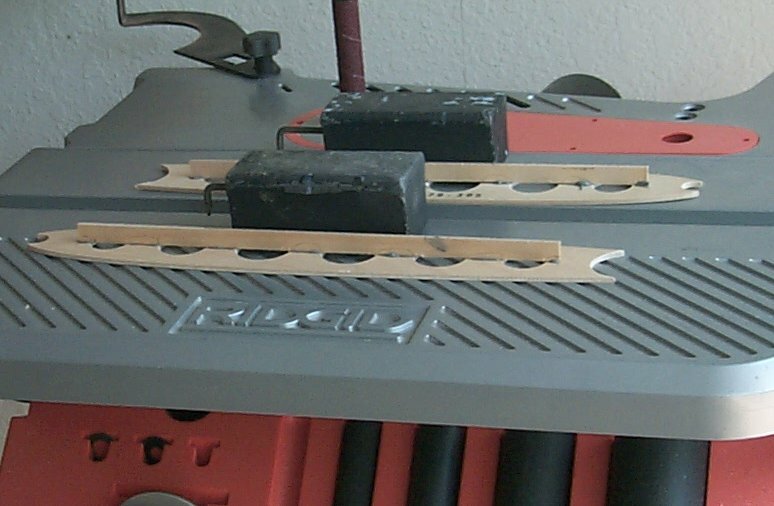 The foam, having very light density, is easily shaped with 220 grit sand paper on a small sanding block. 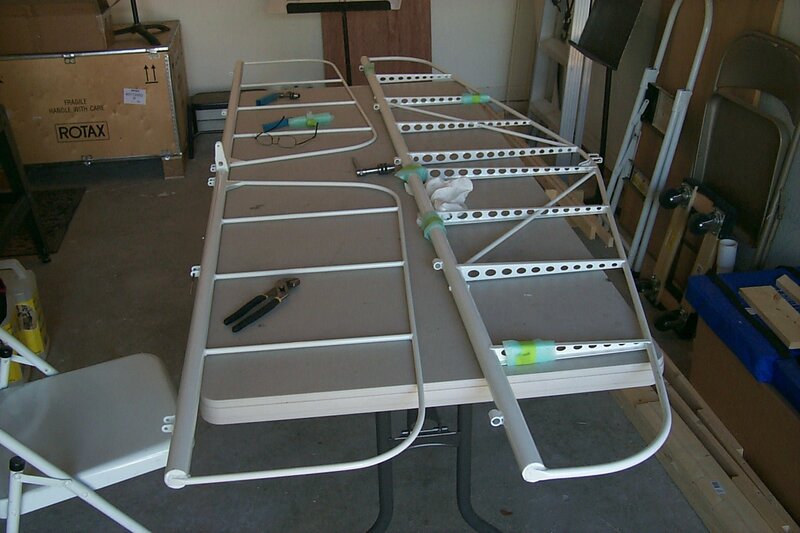 I then layered on SuperFil to be faired after it cures. 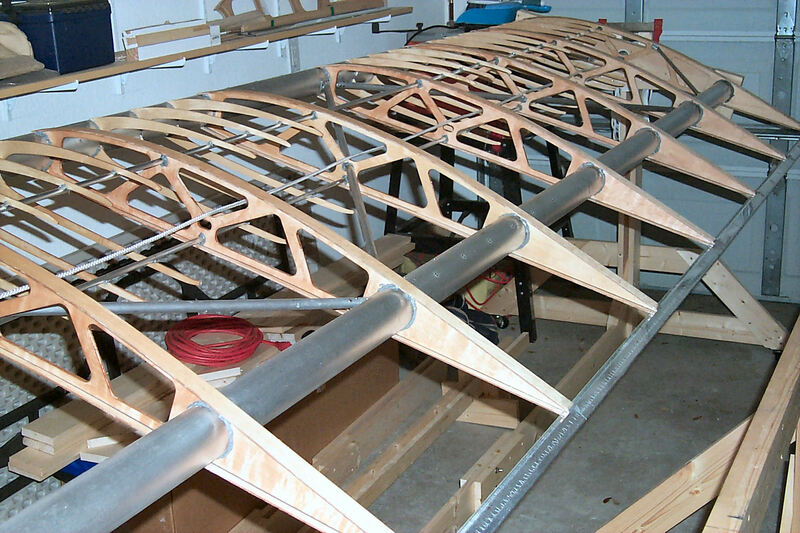 7- 8 May 2010: End Caps complete and two coats of varnish. 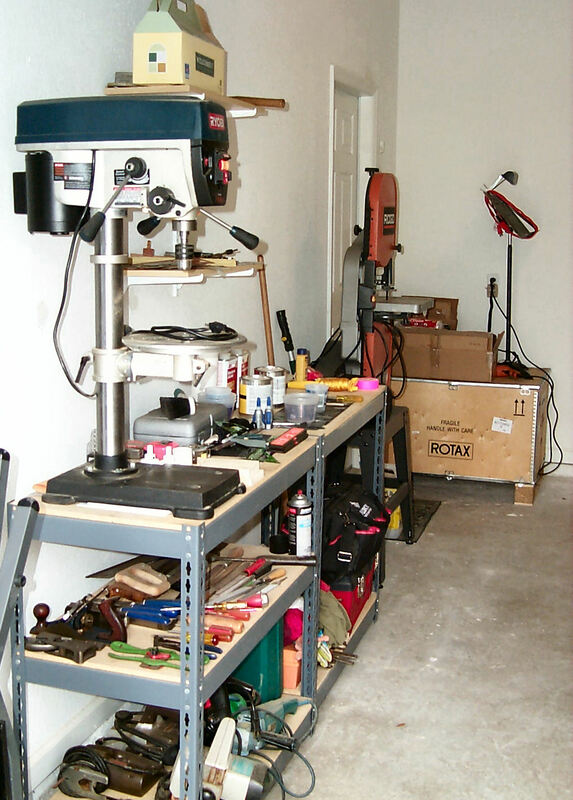 16 May 2010: Making more room in the shop. 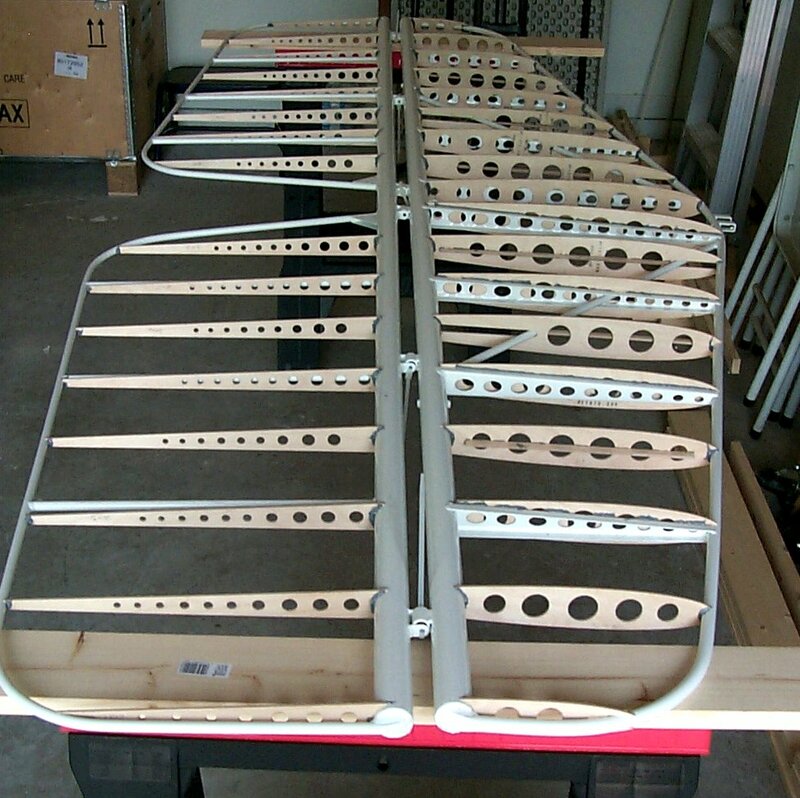 During the last few days I made a rack to mount the horizontal tail surfaces on. 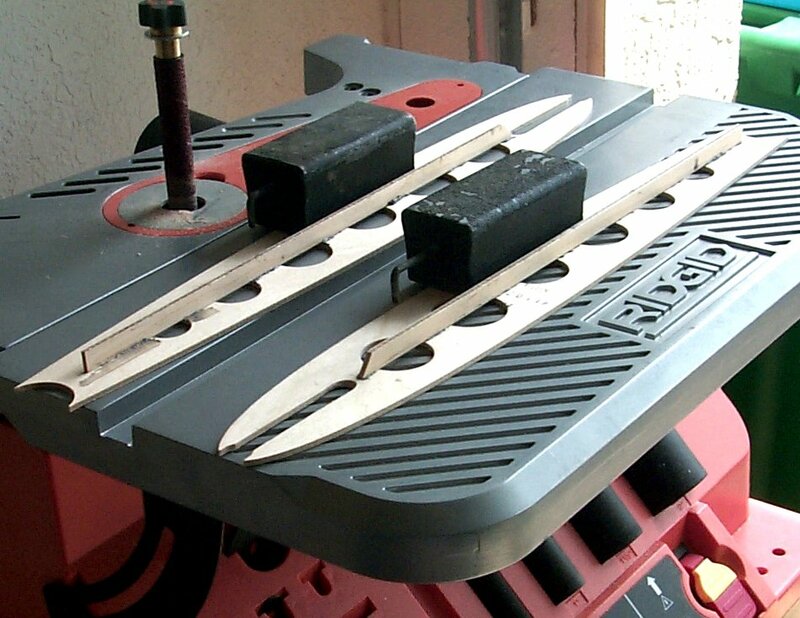 This gets them out of the way of projects taking place on the floor. 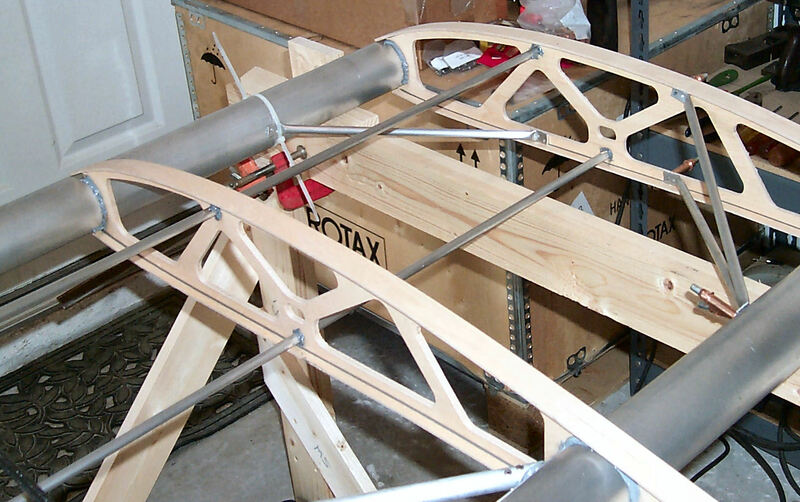 I've assembled a team of helpers to assist me with the wing rigging. 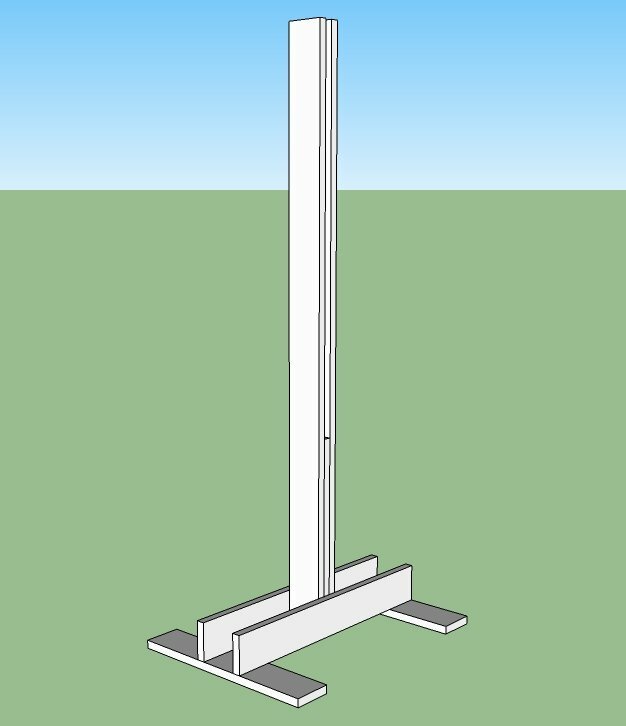 This should take place, I hope, on the 29th. 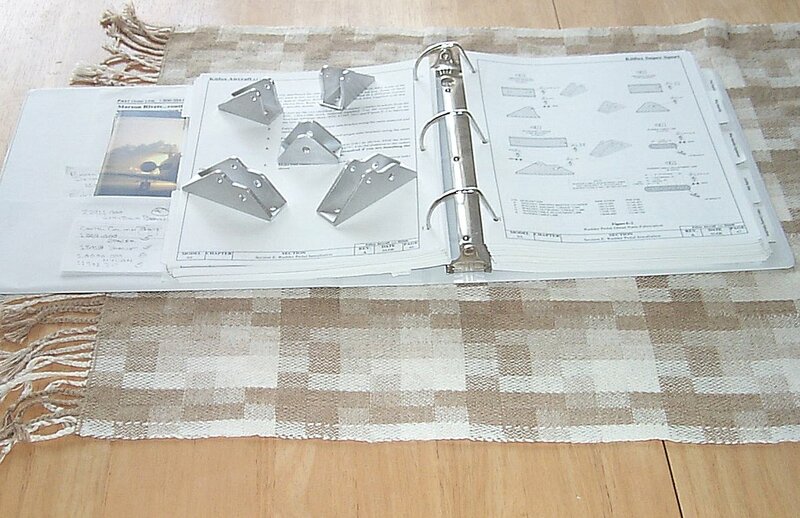 Until then I'm keeping busy gathering up everything I need for that project.